The cost for living with epilepsy is a tough thing to fathom. It is very much possible that the cost for keeping someone epilepsy alive and health until the age of 80 could be more than the amount of money earned by that person were he or she employable. So how can that be? I found it hard to believe the first numbers I came up with when I analyzed the cost for my care of seizures from 1958 to 2003, the day I departed my welfare life. After a day or so of collecting the facts from the records I kept, entering the prices I recall being charged for my care when as a kid with seizures I was covered by my parents’ IBM health insurance program. In recent talks with the family of my pediatrician, we were able to recall such things as costs for visits back then, including housecalls, and the lack of many of the procedures and therapeutic options that are out there today. I recall for example my first CAT scan that I received in the late 1960s. That procedure was so new, the ‘X’ used to map out the brain were about 1/4 to 3/8 inch in size, and only a few of these X’s formed the width, height and depth of the brain cavity that they represented in some of the images in the report. EEGs back then were up to an hour long experiences. In 1965, the laws were such that my pediatrician Dr. D. told my mom that he was concern about those that could result in my being institutionalized. Decades later, following up on my memories of that comment, I found that his concerns were true, although the state had not abided by such rules it had passed for 10 or more years. By 1970 (entering high school), the state had vocational rehabilitation people knocking on my door. Their role was to check out my functionality in school, and determine whether to send me to some vocational program or allow me to undergo some pre-college testing and prep. I underwent the pre-SATs and SATs in the four high school years, and underwent a number of tests, twice, evaluating my math and language performance. Just before graduating high school I had to see the voc rehab counselor in her office to undergo that test they give you on what occupations served you best, and to set up a plan for how to precede. Graduating in June of 1975, I had already placed myself in the Emergency Department at the local hospital as a “candy stripe” worker, or so they called me. My uniform was not the pinkish red stripe nurse’s aide piece however. The MD’s had me wear a plain white garment. At the time, heroin was big in the street drug market. Throughout that time, my primary role was to assist in various events dealing with handling/controlling heroid addicts coming in for each and everything possible. The most memorable case was an anorexic black woman perhaps in her 20s or early 30s, emaciated and anorexic looking, with arms that looked like twigs, bearing tracks of needle marks, and a forearm swollen up like the one in the famous cartoon character Popeye. I had to assist the MD in her fasciotomy, watch as the flesh opened up and capturing whatever oozed out, so her swelling would reduce and her knotted veins healed slightly. In spite of a childhood experience with epilepsy, one that was frequently unpleasant I might add, I was able to land the position I needed to stay out of vocational schooling. Several months after my graduation from high school, I was back in that office talking with the voc rehab person I was assigned to, and convinced her that I deserved to go to community college–I went first for just some EMT certification and an ambulance corps job. That opened the door to premed schooling a year later, and ultimately medical schooling 6 years later. All of this in spite of my ongoing epilepsy problem. Entering medical school in Fall of 82, things went well, but in 1984, one professor saw me during a complex partial seizure event leading me to walk around a bit between classes. He “turned me in” so to speak to the dean, who required the Chief Neurologist to review me, and the school made the decision to confront me about this. 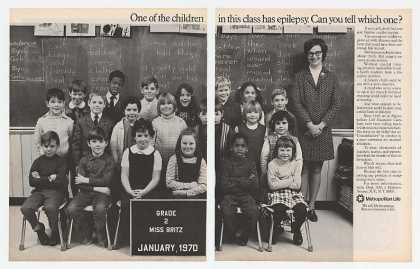 The worst happened in 1985, when the medical school decided it was too risky for someone with seizures to manage patients due to possible loss of consciousness. As a result, the career path I was on stopped. Voc Rehab ceased assisting me. The national non-profit groups serving the cause for epilepsy decided to side with the medical school. The worst critics of an epileptic are the health care professions. When a doctor cares for a person with epilepsy, that physician is guided along the right path. But if that doctor has to work alongside such an individual, personality takes hold of the events, and legal and financial concerns develop. Back in the mid-1980s, this problem was at its peak, and when I tried returning to medical school followed by graduate school in general, I realized that these criticisms and concerns had not gone away. It wasn’t until 1994 when Hillary Clinton made the decision to assist students go off medicaid and return to school that people like myself would no longer cost as much as before to the federal Medicaid program. But the rewards for making such a decision is still not there in the academic and medical world for epileptics. Having all of my paperwork and notes kept about these experiences, I can calculate how much it cost the system to keep me alive from 1985 to 1994. I can also tell you how much I would be costing the system, were I still receiving Medicaid and Welfare financial assistance today. This brings to mind for me a question on the value of how the health care system manages disabled people today. The current managed care system is designed to reduce the costs for health care over the next decades. But how effective might it be? And does it/it’s leaders have a true understanding of the long term cost for care of the retired and the disabled? It is my contention that healthcare leaders at the government and academic and institutional (insurance company/PBM) level ignore this problem and are doing nothing to make the current system better. 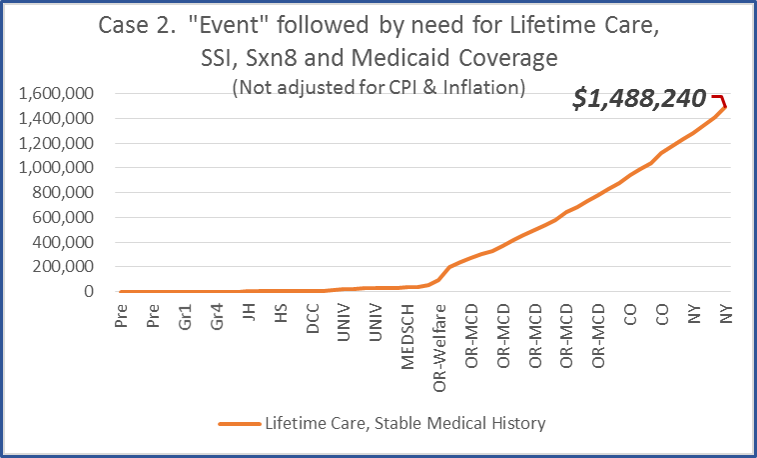 We see what appear to be some very supportive changes when it comes to reducing the costs for care, yet at the current rate of change and current costs, to keep a person alive past retirement and well into his or her older years will cost us millions of dollars, per person. I can argue this amount based upon how the cost for my care during the epilepsy years changed between 1957/8 and now (2015). 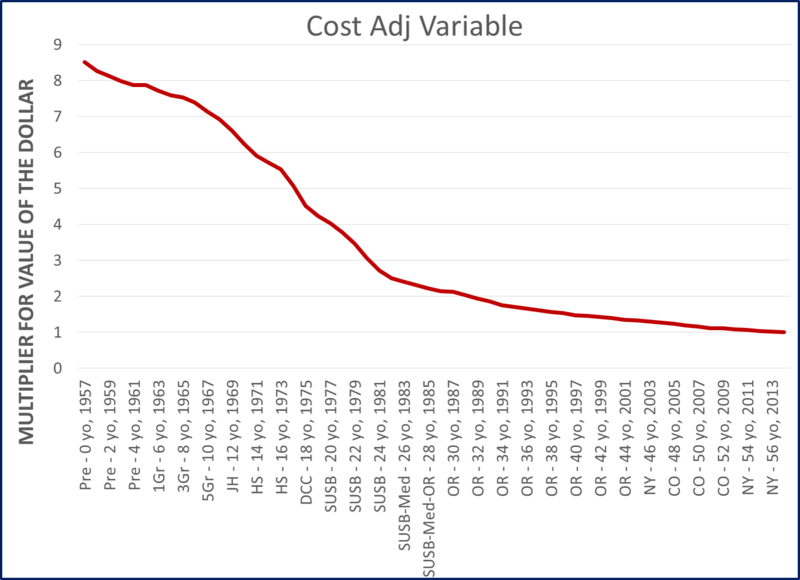 Method for charting costs over time: approximately 28 cost factors were defined, and evaluated as 20 entities. 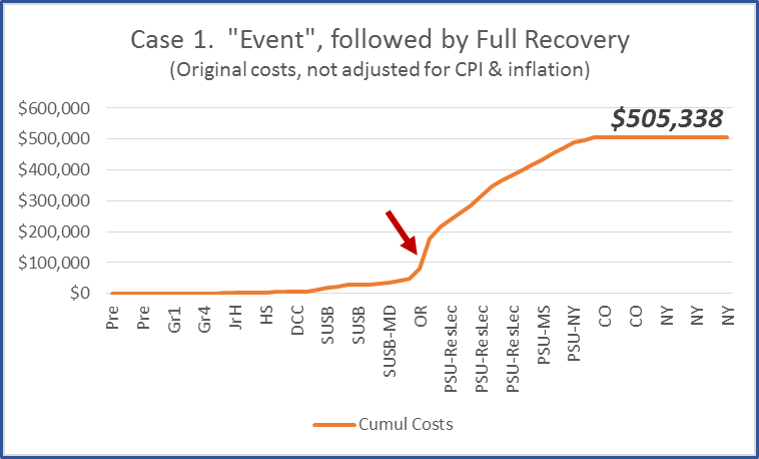 Some entities were repeated costs developed during different time intervals (i.e. Social Services, PCP visits, Voc Rehab), but counted as same cost type (placed in same column). Is it possible to assign a financial value to an individual who has epilepsy? Or taken differently, is there a value to living with seizures and experiencing the ups and downs in life that will happen due to your recurring seizure problem? An equally important question to ask pertains to the “value” of seizures or living with the diagnosis of epilepsy. Because an individual is diagnosed with epilepsy, a variety of costly practices and behaviors come to mind when effective treatment is imperative. Doctors that provide these people with medical care, often engage in reactionary practices, therapeutics that are typically designed to suppress seizures from happening. One of the first effective chemical agents found to treat epilepsy very effectively was lithium bromide, a unique form of medicinal mineral waters known as lithium water. The second most effective chemical to surface was phenobarbital, a substance derived from the oil-coal tar industries, found to influence the work performance of employees of certain factory settings during the early to mid 1900s. Medicine has often had the desire to develop and effective form of preventive health program meant to service people with epilepsy, making it possible for them to live with less seizures, or less severe seizures, or to reduce the fear they have of not being able to control their health condition, the likelihood of another seizure event recurring hours, days or weeks later. In more recent decades, we have come to include counselors in a typical epilepsy treatment plan. This role of the counselor is to inform the patient about the need to know his or her personal and physical abilities and inabilities due to this medical history. The counselor has more recently taken on numerous other roles in assisting certain people with epilepsy finding the right therapeutic course to take, and how to best live with the limits that a seizure history can have on your role and performance in the workplace. In effect, it can be said that every health care practitioner or allied health individual who is engaged in the treatment of epileptics is there to improve the quality of life and long term performance and survival of someone with epilepsy. Be that person diagnoses with simple localized seizures, or the kinds of diagnoses that are most often linked with generalized convulsion, no matter what the ultimate diagnosis is for the kind of seizures that impact a person, no matter what the problem or its severity, treating, preventing and recovering from a seizure event, as well as preparing for the next day or the next time one has to go to school or work in spite of this history, whatever actions are taken to treat a patient costs the health care system money. The amount that having seizures can cost someone, in a conservative sense, costs the government and people a minimum of a half million dollars per individual with a recurring lifetime or mostly lifetime seizure actively recurring seizure pattern. Ironically, the actual frequency of seizures on a given time basis, such as per day, week, or month, has minimal impact on the total lifetime coast for this potentially lifelong health experience. When we look at the long term costs for having epilepsy, the earliest events are what define what will happen later healthwise. These later events are what define the ultimately cost for treating an individual who has epilepsy. The numbers of seizures per given period of time, the numbers of hospitalizations per year, the numbers of days a person with seizures is disabled due to an “episode” only impact the long term cost for care in that if an when the health care system fails to respond to them in the most correct way possible, it is that system and its healers that define what kind of long term life expectations that a person with epilepsy will ultimately have to live with. People with epilepsy are responsible for their care and future as much as the healthcare staff involved in each case should be. This is why we pay doctors, nurses, counselors, school psychologists, occupational therapists, home care givers, directors of non-profit groups, neuropsychologists, vocational rehabilitation counselors, Federal Medicaid workers, to provide the services that they are trained in to epileptics. Their role is to make the quality of life better in spite of your serious re-occuring seizure related experiences, and to make it possible for you to take whatever path you wish or need to take. Unfortunately, this is not at all the case with the current health care system. Healthcare providers based their judgments only upon what they’ve witnessed take place as short term live events. reviewing an entire life experience tells us the kind of life an epileptic has to live, and why such as experience not only happens, but is in many ways ridiculed, ignored or tolerated at the clinical and social guidance level. To prove this last claim, one need only ask a single question: How much money does a person with epilepsy cost the healthcare system? How much money is needed to keep an epileptic alive? At what age does the action needed to improve the quality of life for an epileptic need to begin? What are the consequences of not reacting to this particular sociocultural medical need? Do the programs we provide for epileptics, in the long run, save us money. 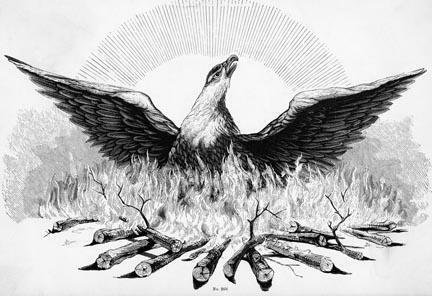 If we compare them to the possibility that an epileptic may return to work, make a living, and ultimately become less dependent upon the social services programs, how much of an income change is generated by converting the personal “disabled” by epilepsy, into someone who s no longer living as a pauper, but instead in paying back to the government system in the form of taxes? Unfortunately, none of these questions can be easily answered. So just how much are all of these activities related to treating people with epilepsy costing us? How many dollars are spent providing the care that is needed by an epileptic to maintain a decent quality of life? Just how much does the care process itself cost the healthcare system, insurance agency, or taxpayer as a whole over the years? How much is the life of an epileptic worth? How much is spent to keep them alive? For how long? I did the calculations needed to answer these questions. I base my numbers of my own life experience. I found, that in my case, which is very unusual, the cost for my care to society, the taxpayers, the government, and the teams that produces and managed the Medicaid system that I was so dependent upon, was only just under a million dollars. For a little more than the first forty-four years of my life, that amounts to $21,626.78 per year, on average. Afterward, you have the costs for another neuropsych evaluation, along with the physical therapist, occupational therapist and speech therapist. A few of these costs went on for a number of weeks more as part of the costs for my “rehabilitation” after I left the hospital. Normally, after you leave the hospital for something as serious as brain surgery, you get to stay in a short term 24 hour care facility, usually for about a month of two. I didn’t have to do this fortunately; my mother stayed at my place. That saved the state and Medicaid program at least several thousand dollars. None of the information about these costs escaped my consciousness since those years. I interpreted them as some sort of lesson, and later used this reasoning to argue about why I decided I should not remain a part of the welfare program for the rest of my life. Now granted, I was receiving all of these health care benefits for free, at the cost of the taxpayer responsible for the state welfare program I was enrolled in. My entry into the State Medicaid Program happened about 5 or 6 months before the neurosurgery, just before the WAIS and initial electrode implant with a week’s worth of sleep monitoring. The final surgical process itself happened on December 19th, 1988. I was in the hospital for 10 days. Now, 27 years later, I am enrolled in yet another education adventure, trying for a PhD, which is why I decided it was time to evaluate these costs, with a new look based upon what I am learning in the healthcare admin PhD program. I partly due this for reasons of continuing my past reviews of what I have endured. Over the decades, the system in general has not been good to a successful post-neurosurgery outcomes like myself. The status quo expect a post-op epileptic to remain eligible and enrolled in the Medicaid program he or she is in. There are very few scholarships available for epileptics to take advantage of, and those that are out there appear more as token gestures of respect for people with epilepsy. Living with epilepsy is itself worthy of recognition. However, most people have some personal experience worthy of similar attention. So it is not expected for every accomplishment that is made by everybody that is out there, including epileptics, be granted some special status. In general, it is up it the culture at the the time to determine who or what is rewarded at a particular time, and who or what is not. This human side of judging people is not necessarily ethical or morally perfect all of the time, but neither is the purpose of this review to condemn everything that takes place out there due to human behavior. All people are, by example, prejudicial, opinionated, judgmental, and disenfranchising to anything out there in search for some sort of moral support. People are by second nature prejudice, for which reason people who are disadvantaged, like epileptics wishing to learn, as as mistreated today as much as they were the first decades after they were removed from the common prison setting around 1800. The only thing still shared today with yesterday’s belief about epilepsy, is that they have a problem, but at least it is not directly related to society’s criminal behaviors. But back to the purpose of this posting. It is not my intent to put down the program that is out there, as much as it is to note and emphasize what is NOT out there and what SHOULD BE out there, for epileptics to benefit from, not for npo’s and the like to benefit from because the epileptics in dire need of their services are the financial reason they exist. An old conspiracy hypothesis this reminds me of would be the notion that they don’t want to cure you, because if they could, their program would fail to generate the income it is producing. From The Medical Repository, a journal for the New York Medical College, 1812. The main question here is what medical school practitioners and professors teach, and what the profession does–why are these counter to each other? For every dollar you contribute to a program devoted to assisting people with epilepsy, the epileptic is lucky if an organization puts out a quarter of its investments per dollar that is handed over by parents of kids with epilepsy and the epileptics themselves. Grants for people with epilepsy are outnumbered by those out there for the visually and hearing impaired, the physically handicapped, those with interests in attending college in spite of birth defect or developmental or hormonal disorders. Potential students with some of the rarest medical diagnoses have plenty of opportunity to go to college, not epileptics. The epilepsy scholarship program that is available serves only a handful of individuals, and even then has its issues regarding the selection process. Of the many full year tuition programs that are out there for applicants to university, less than five at any time are available for someone with disability, and for some of these scholarships, one has to stretch the rules somewhat. 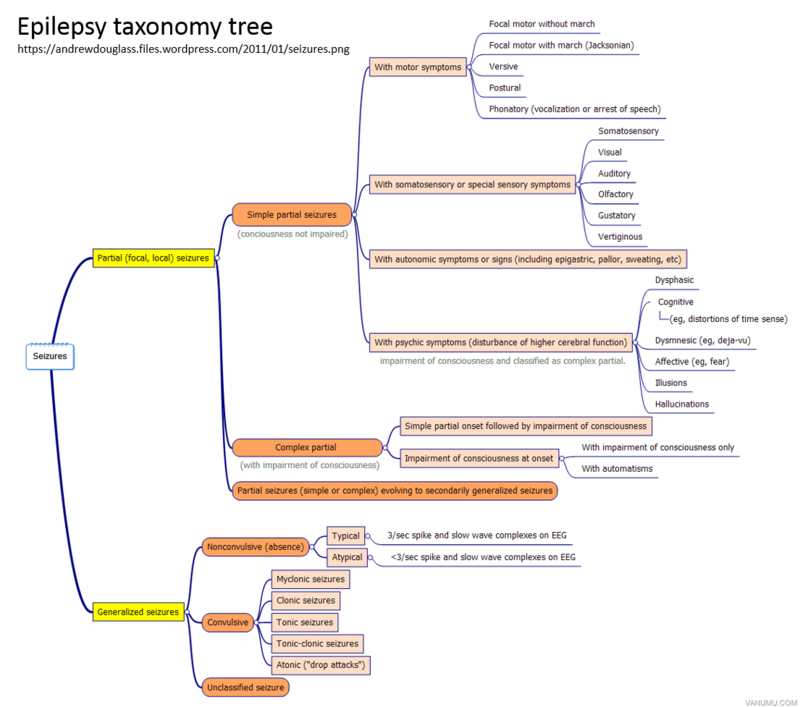 In discussions about this issue more than twenty years ago, it was stated that epilepsy is typically not covered in most disability and potential learning disabled grants (such as the grants for autism) due to the assumption that the other national agencies devoted to this medical issue provide such opportunities. But I learned over the years that re-researching that claim results in no finds. When I revealed to them my findings that only a series of scholarships totaling about $20,000-$40,000 (depending upon the year) exist for epileptics who wished to go to school, but only as $2500 scholarships awarded to just 8-10 (sometimes 20) applicants were available, the agencies did not believe me. In 1992, I made it even clearer to the academic officials devoted to disability how wrong such claims were, when I showed them that the scholarship that did exist were only designed for young kids that entered college as freshman students. Of course, the hidden message implied here is that the various epilepsy agencies don’t think epileptics can manage college programs. If they did, they would reward any such person with a compete first year scholarship like many honorable programs and institutions. So, my education in epilepsy as an undergraduate student, and later as a medical student taught me that the system is there to help you as an epilepsy student, but only in a very limited way. This means you have to find those options in life than the given. Giving into disease is what makes it control your life. The decisions you make about what to do, where to be 5, 10, 15, or 20 years down the road, define whether you recover or not, whether you live or die, for the most part. To me, this meant that there was no way I was going to continue to sit in those chairs waiting to see the Medicaid officer again for my annual case review, every year, for the rest of my life. There was a way out of this dilemma I knew, due to my schooling. I had therefore been given the chance to define what path to take. 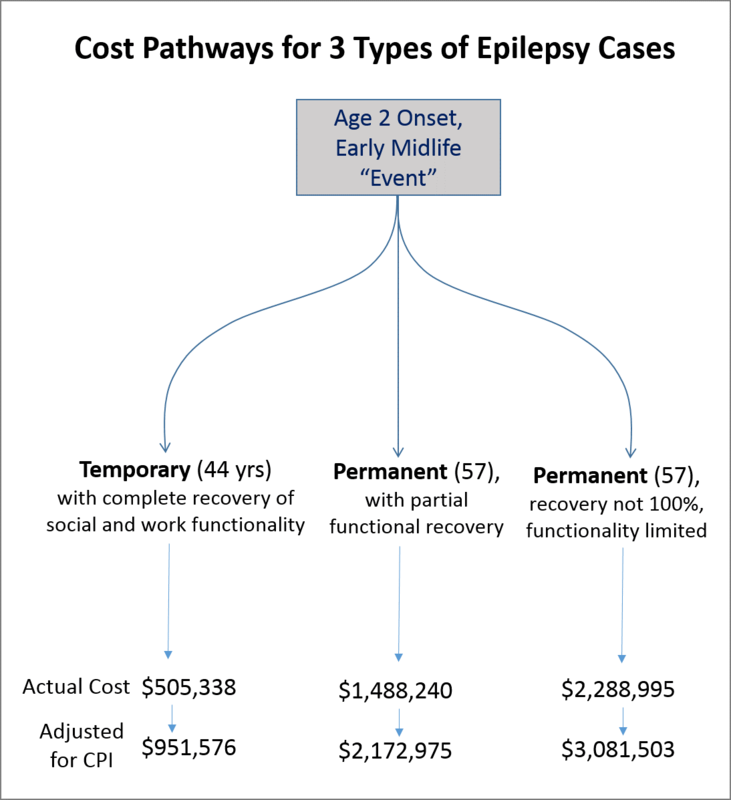 To review the cost for a patient with epilepsy, these experiences led me to decide there were three possible paths I had to review. The first path was my own–including everything through and after the medicaid eligibility years, up to the present. I am now 57 years of age, and more than a quarter of century past my neurosurgery year. Two, going on three, advanced graduate college degrees later post-op, I am fortunate to have been able to take this route to learning. But what were the consequences of these experiences? Are they worth having other epileptics consider as part of some future life plan? Are they worth pressuring the federal programs, the state programs, the population at large to promote for other people with epilepsy to improve their quality of life experience with? What prejudices do I myself have due to my own experiences with these frustrating parts of the health care system, to result in how I now interpret this review of costs over time? It ends up that my case may be just one notch above an average case in terms of cost analysis. There are cases of epilepsy that impact the lives of patients to a lesser degree than my own. Relatively few epileptics undergo the very aggressive neurosurgery option to deal with their condition. Most depend upon pills for most of their life, a good self-image, a few counselors and a decent network of healers, hopefully focused on your expert neurologist/epileptologist. 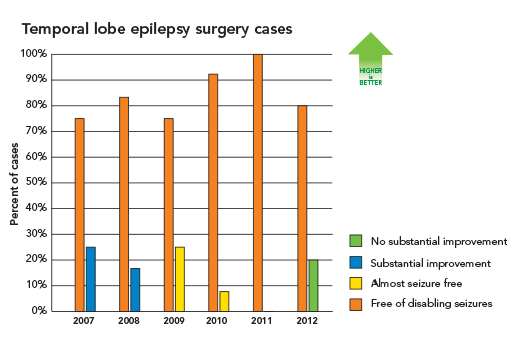 The numbers of epileptics who undergo neurosurgery have even lessened to some extent, replacing removal of brain tissue with the option of electrode implants, which are used to monitor cerebral activity and activate the brain in certain ways to prevent seizures from forming the focus needed to cause a full-fledged seizure to develop, one for which consciousness is lost, and movements and activities no long in conscious, awareness-related control. These milder forms of electroshock are now the away to treat people with recurring, usually mild seizures. Not the aggressive removal of tissue that is already so abnormal, that losing has limited impact on your mental functions, except to cause a special form of lapse in memory or two (i.e. Wernicke’s Aphasia, Conduction Aphasia). The cost for my personal case in my life span, out of my pocket and the pocket of my parents and health insurance companies, is about a half million dollars. That is to say, for all of the events and healthcare procedures linked to that day I had a febrile seizure at just 3 or 4 months of age, have cost the people involved about $500,000. A half million dollars seems like a lot. But remember it is for 57 years of health and healthcare experience. That means the total averages to less than $10,000 per year. Or to be exact, $8,865.65 per year. [$505,342 / 57 years]. If I had not been so lucky . . . and had not found my way away from the dilemma I was 1with no choice other that to make it through the rest of my life in this manner. If I had a moderate or somewhat normal seizure experience in the years to come, I would have cost the system about $1,488,240, or $26,109.47 per year by now (calculated for 57 years, more on this is a minute or two). But this also means that I saved the system about $982,898 or about $17,243.82 per year, if divvied up over the entire lifespan, by resolving a situation that the federal systems in place are designed not to resolve. Still, it is better evaluating this worth in real time. After all, the clock starting ticking on the high costs for my care when I reach the age of 27. That is when the need for neurosurgery in order to stopped the intractable seizures seemed inevitable, but due to its innovativeness was refused by the university hospital I was a student at. 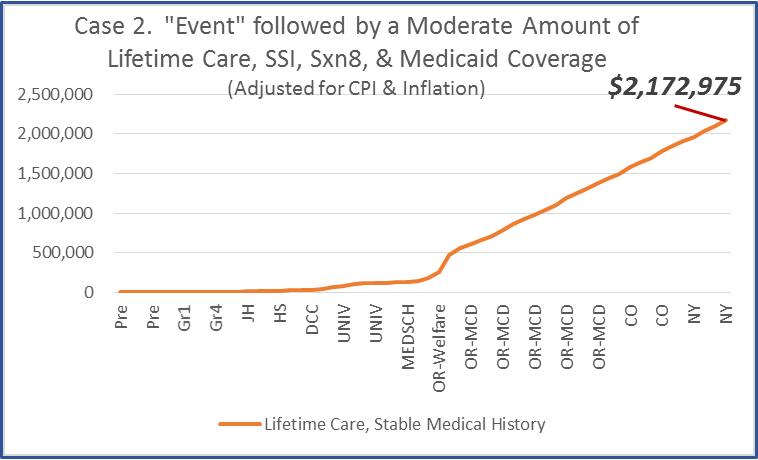 Adjusting for inflation and the changing consumer price index over time (how much you get for your dollar, applied to health care), the amount I just stated for the 30 years of Medicaid managed care is nearly doubled. 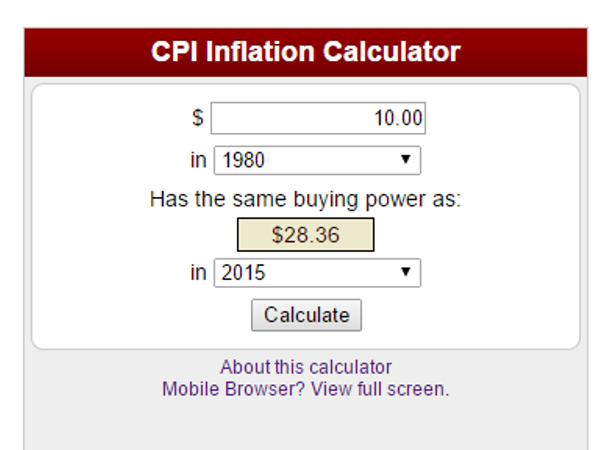 Using a $10 amount, and evaluating the price changes one year at a time, from my birth year forward, this site provided me year by year values for the change in value of a ten dollar bill, along with the multiplier for each change. 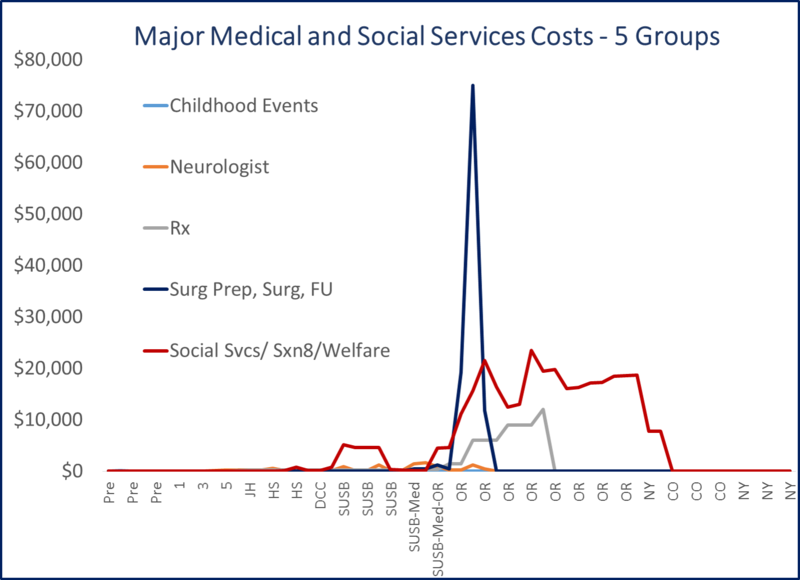 I plugged this data into an excel spreadsheet and used it to recalculate all the numbers provided for the costs of whatever services or experienced I noted. This resulted in new values assigned for the health care procedures I experienced due to epilepsy. Note, it does not take into account the changes in technology of medicine that have taken place over the past 57 years. For example, a visit to a doctor’s office in 1958 was very different that if the same visit were to happen today. There would be more tests performed today than back then. more procedures required for diagnosis, perhaps even more options with therapeutic routes and counseling/mental health functionality and assessment routes, had I been diagnosed today with having temporal lobe epilepsy. None of these new treatment requirements are considered here–only what really happened. So the adjusted costs for what I went through in my life, were this same life re-experienced, changed from a total of $505,340 to $951,578 ($446,238 more), representing a 88.3% increase–1.83x the out-of-pocket, live price, or a little less than a doubling of costs. This means that over a thirty year span, I would have cost the government/taxpayers about $31,719.27 per year, a $14,474.53 difference or increase from the unadjusted costs. So calculating those savings over the 30 years period, instead of 57, this means the value of the process for dealing with my case, to the state and federal government, is $982,898/30 or $34,763.27 per year, for 30 years. That is how much I saved the system by being able to manage my own health problem. Now, these numbers are more accurate. and they haven’t taken into account the others factors often review when evaluating expenses over time. Inflation, and the change in the worth of the U.S. dollar have to be taken into account. Relating this same logic to the less successful, moderately improved quality of life patients, who did not eliminate their seizure problem, the new cost for treatment becomes $2,172,975 instead of $1,042,792, a difference of $1,130,183 representing a 108% increase. 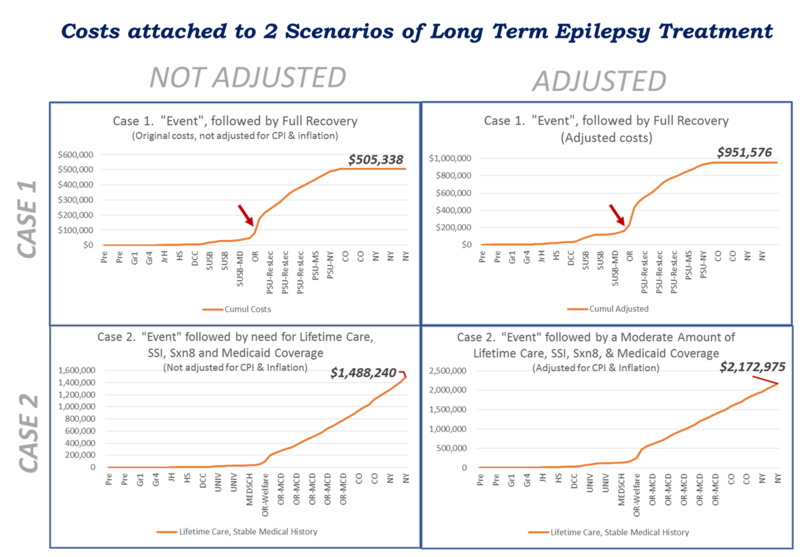 When we apply the same cost adjustment formula to the case of a patient whose life is “moderately impacted” by epilepsy, requiring his or her retention in the Medicaid program during the later mid-life years, the results we come up with are as follows. Services rendered at a total cost of $1.49 million are increased to $2.17 million. In the graphic displayed with this data, the increase in range of the vertical (y-) axis makes it difficult to even see the event where all of this happened in my life (that small rise where it says (OR-Welfare). 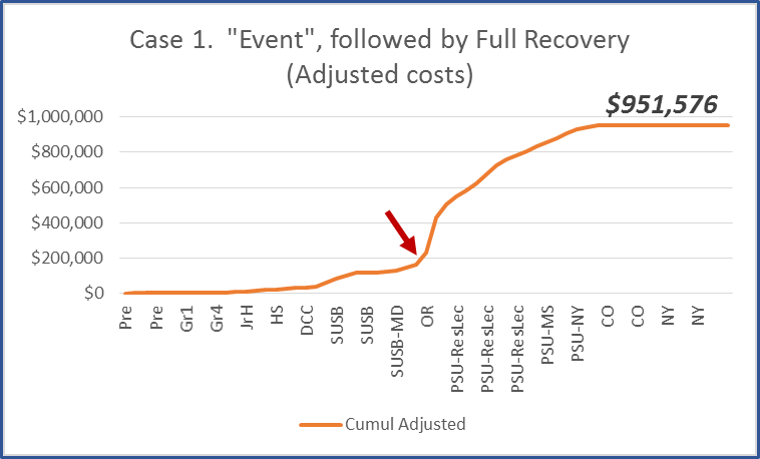 That single event represents a neurosurgery that cost the facility and government about $50,000, according to an RN on the surgical team whom I discussed this with, back around 1990 (18 months post-op). There were two pre-surgical steps involved as well that were of considerable cost. The first was an mandibular electrode implant to monitor the brain more closely next the the temporal cortex, performed four months prior to ‘the big event’. The second was for a neuropsychology function test. Together, these and the prep and post-procedures steps, altogether came out to about 50,000 more in costs, making the entire process (3 OR steps, staffing, anesthetics, etc. etc.) worth $100,000 at the time–$about $200,000 once inflation and consumer price index multipliers (CPI) are included in this formula. Treating the above values like I did for my own personal, recovery case, this means that in today’s currency, all of my medical procedures over that 30 year period, from 27 years fo age to now, would cost the government/taxpayer on average more than $72,432.50 ($37,672.77 difference from raw value calculations) per year. What constitutes a high risk case in epilepsy? A high risk case is one in which the lifelong experience is not only complicated by the typical events of dealing with more common epilepsy experiences, but also an increase in the severity of these events over time, to such a degree that more hospitalizations are required and more aggressive interventions are necessary. Many of these cases may be classified as “intractable” and are coded as such based on the ICDs entered into the EMR. Typically, the longevity of people with severe intractable cases is shortened. This because the lack of control of seizures can have a significant impact upon feelings of self-worth and blame, resulting in one of the “positive-feedback loops” which results in a bad case getting worse over time. Intractable, high risk cases are often linked to early death due not only to the seizure event itself, but also to events secondary to the seizure such as accidental falls, head injuries, walking into traffic, post-ictal events, etcetera. Additional causes for increased mortality might include complications related to secondary comorbidities, such as ictal or post-ictal physical medical conditions or behaviors linked to psychiatric and/or psychological behavioral patterns. Suicide, for example, can result in some cases. Lack of concern for personal health, by way of unhealthy street drug use, overconsumption of alcohol, and other unhealthy behaviors that can lead to death. In the above figure, the cost for such an experience in the out-of-pocket sense is about $2.89 million by the age of 57. Adjusted costs for these cases consist of a rise of just $0.11 million, and amount to just over $3 million. 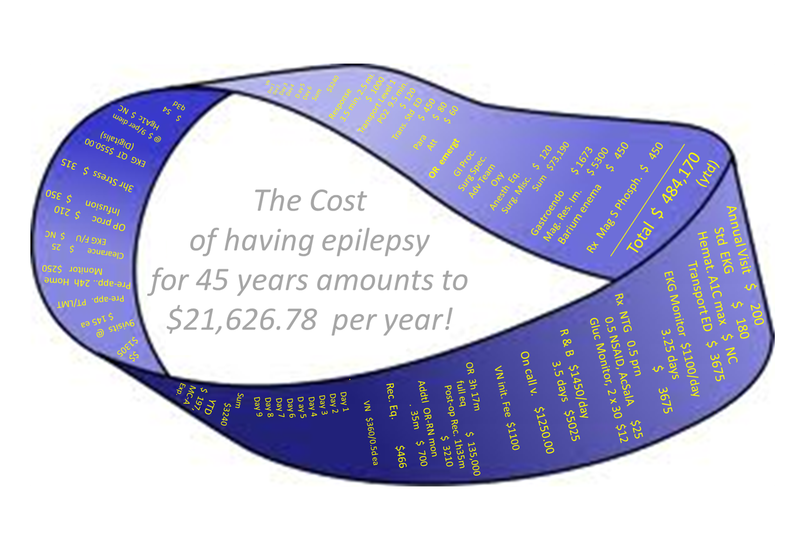 Now, what about the total cost for someone who has epilepsy, throughout his or her lifespan? First, asking this question is somewhat problematic. It does not consider the expected changes in lifespan of people with epilepsy, whose lives are shortened either directly or indirectly due to events related to epilepsy. Setting that aside, we assume that these people are somehow miraculously kept alive no matter what happens, and that they never experience a very high cost single event that often takes the life of its victim. Instead we assume they have many non-fatal events, thus defining their high level of risk. The risk assessed is the cost for their health care. And so, we assume that a high risk epileptic, with many seizure events and emergent/urgent care needs, who is kept alive all of their years, is able to reach the age of 80, in spite of their medical condition worsening at a fairly stead rate. just how much these individuals cost the health care system? is the question being addressed here. Surprisingly, the cost for such an individual at first appears just slightly higher than the moderately changed individual with epilepsy. The total cost evaluated here is $2,288,995 for the unadjusted cost. For my case, the maximum cost for epilepsy was reached once I was off the medicaid program and no longer required doctor’s visits for keeping up with my history or renewing the refills for prescription drugs. This lack of need for continued care came to be in October of 1994, when I realized it was possible to no longer take my medications so long as the right mindset was in place. This manner of withdrawing from the epilepsy treatment program is not recommended to most or nearly all individuals with epilepsy. And the manner in which I made it possible is worthy of discussion elsewhere. 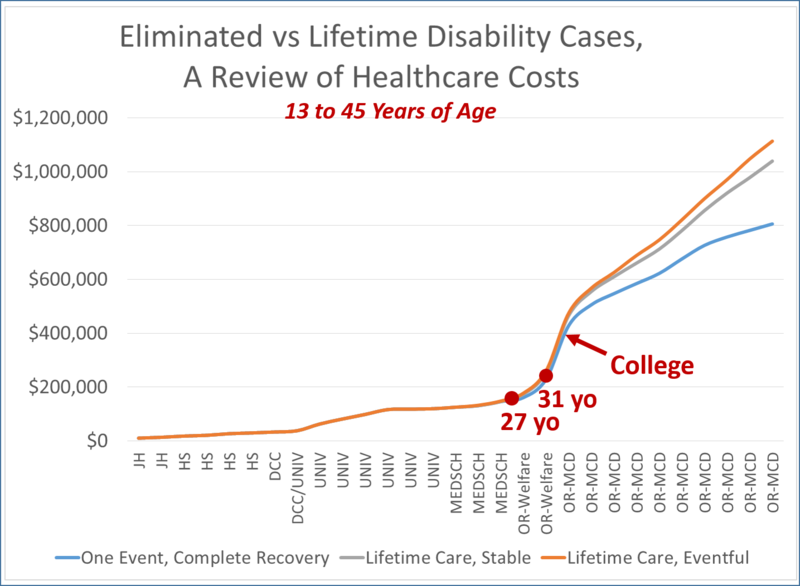 But this case, represents how once the seizures are gone, you can reduced the needed visits and use of the medicaid system, and over time no longer need prescription drugs, and ultimately make the needed life changes, should you desire to do so, such as going back to college, or entering (re-entering) the workforce. With each of these positive actions taken, the likelihood of requiring more epilepsy care lessens, and the cost for being managed for you epilepsy diminishes, and finally goes away. 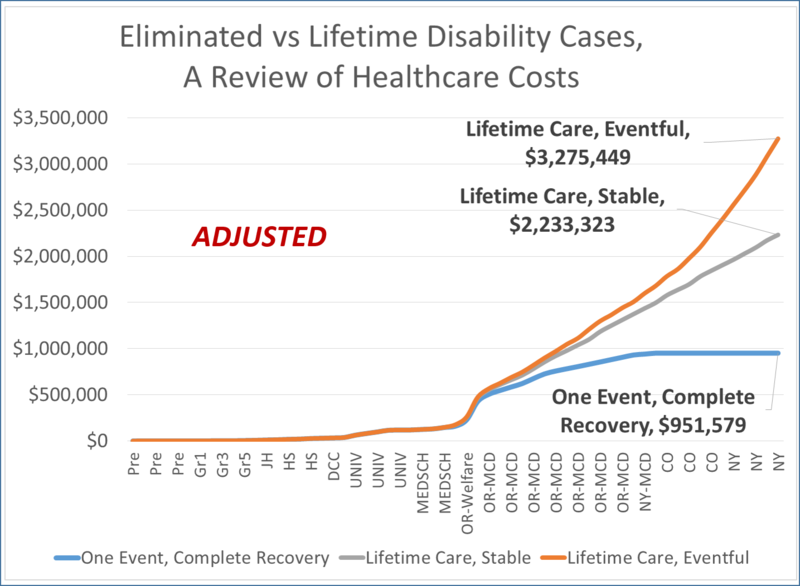 As noted above, the cost for my care also results in a “Prediction Model” that predicts the epilepsy will never return. The result therefore stands at the costs needed to make such a long term outcome possible. The cost for my care was $505,340, for 1958-2003 about, adjusted to $951,578, as total amount spent by the age of 57. The second scenario provided is of a person who underwent the same procedure as myself, but has a slightly more complex history before and after the main event. Due to this increased seriousness of the case, the individual fails to completely recover, and so lives a life with the seizure history, tolerating everything he or she can, as much as possible through the remaining lifespan. This is meant to represent a fairly typical case. Although the surgical history does make the first case different from many, if we interpret that first event as an “Event”, of any form of fashion, and assume that many of not most epileptics do undergo such an event that is health or quality of life changing, then we can ignore the impact of that single event. As the chronological price charts will demonstrate, whether or not such a drastic event occurred in an epileptic’s life is not really much of a concern. In a long term sense, it has minimal impact on overall costs for treating the seizure victim. In the case example provided, the cost for that event was estimated to be $50,000 in the actual workplace, with an equal amount of costs added on in the form of pre-surgical testing and processes, and post-surgical follow-up and ongoing therapeutic and recovery processes (i.e. MRIs, EEGs, occupational and speech therapy for left hemispheric surgery, etc.). 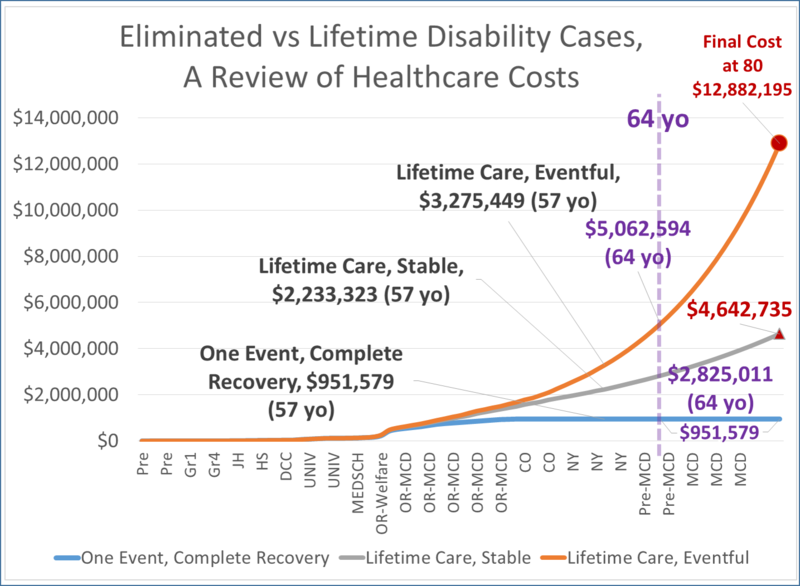 The cost prediction model for this case assumed that the individual survives until the age of 80 years. 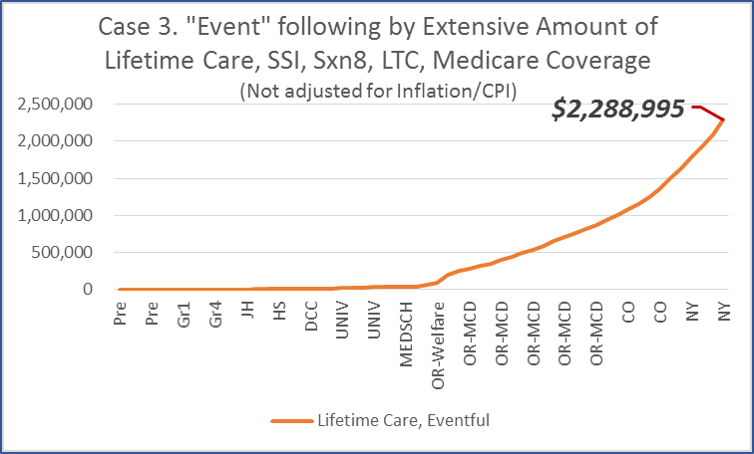 Based on the above example, which defined $2,172,975 as the adjusted cost for care by the age of 57 (adjusted for inflation, consumer price index related value of the dollar changes over time), the projected cost for care of this person is $4,642,735 total, or cumulative, by the time the age of 80 is reached. This projected value represents a more than doubling of total expenses (a 2.13658-fold increase) for treating this individual for the final 23 years of his or her life. The $2,469,760 generated over 27 years represents an average of about $91,472.59 per year. For a middle class family member, this also shows that the cost to the system for an individual having a disability and being unemployed, is about equals to the income generated by that same individual being employed instead. This third case represents a high cost scenario, in which the “average” moderate risk lifestyle is jeopardized in several common ways. The ‘High Risk’ case produced a cost of $2,888,995 based on original payments made in the medical history. This amount was adjusted by the CPI inflation defined equivalent dollar value multiplier to $3,081,503. This demonstrates that in spite of the increasing numbers of smaller events during the earlier childhood years, and the post-“Event” stage, by the age of 57 (30 years later), overall costs for keeping this person alive and health haven’t increased too much. The increase in cost is $908,528, a 41.8 percent increase from the previously described ‘Moderate Risk’ case. 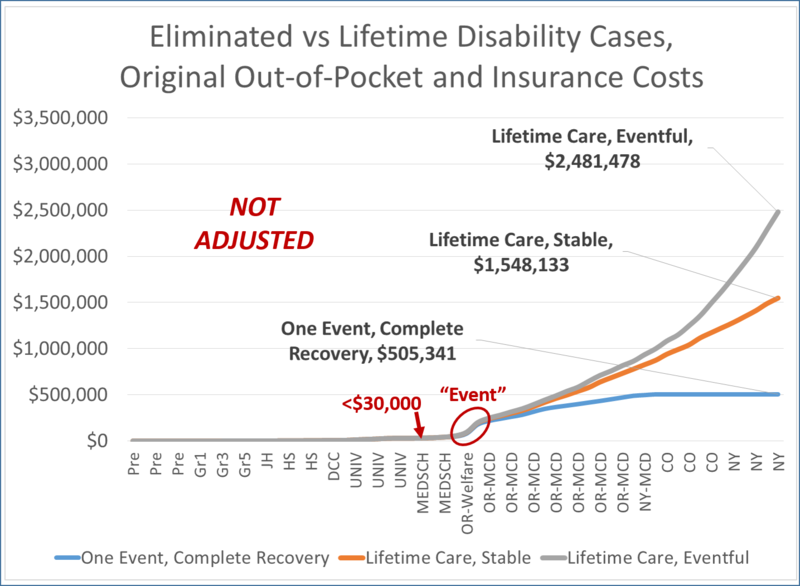 One thing to not with the higher risk case, is the impact of new requirements to keep the individual alive. The greater number of medical events are assumed to not be fatal, but do require more focused, and even personal care over time. So the daily care requirements added to this scenario are the need for more directed care and care givers, and the ultimate requirement of some assisted housing. Typical healthcare programs have limited provisions for in-house care, or care provided by a long-term care (LTC) facility the individual has to reside in. For this case, a two year period is assumed, meaning that long term care provisions were not provided until the person reached 78 years of age, and therefore underwent it for the two year period of 78 to 79.99 years of age. The line generated by the previous two decades of care, prior to the age of 57, dictate the curve for the subsequent 37 years. With this in mind, it was estimated that the cost for care of such a person, who is in exceptionally poor health and yet remains around another two decades, is approximately $12,882,195. $12,882,195, for 23 years of care, represents an average of $560,095.43 per year. 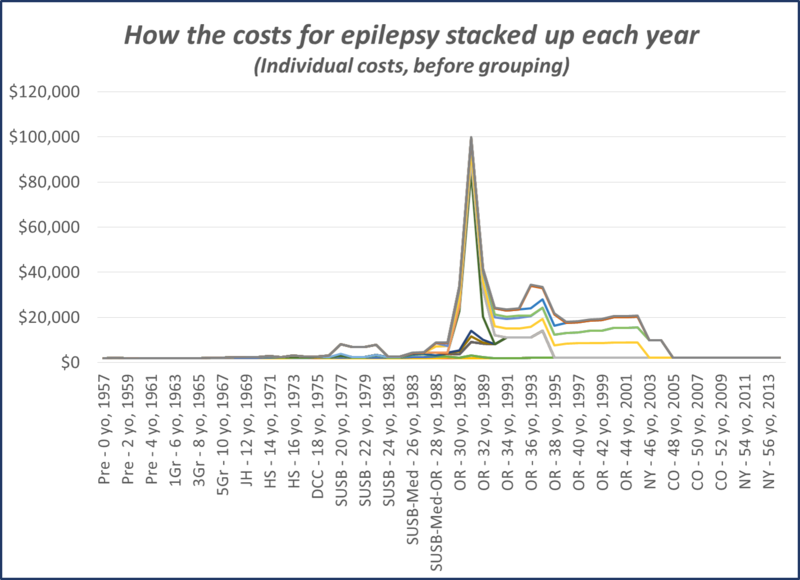 Even if we consider this estimate to be a drastically mistaken, and we cut these amounts in half in the end, we still end up with a high cost for caring for somebody with epilepsy–$6,441,097.50 total, averaging $280,047.73 per year. That’s more than most people earn in a year for the final years of their career path. The lack of adequate programs designed to facilitate the recovery of potentially productive epileptics back into the workplace has a phenomenal effect on the healthcare system. The burden of care linked to epilepsy can have a major impact on the cost for healthcare in the decades to come. Currently, the epilepsy programs that are out there do not provide adequate services to people with seizures. These inadequacies in turn place the epileptic in a very unstable life-work setting. The lack of much needed financial services means their quality of life and way of living, below the poverty, could no doubt outspend whatever finances the current programs have to cover these anticipated changes. But as Case 1 demonstrates, departure from the current way of living, early on in life, has the potential of saving a healthcare system at least 12 fold in savings, 5 or 6-fold if the desire is to be conservative with your estimate. Exactly how many people in this country have the same experience is also a question that needs to be answered, if this model is to be of any value. 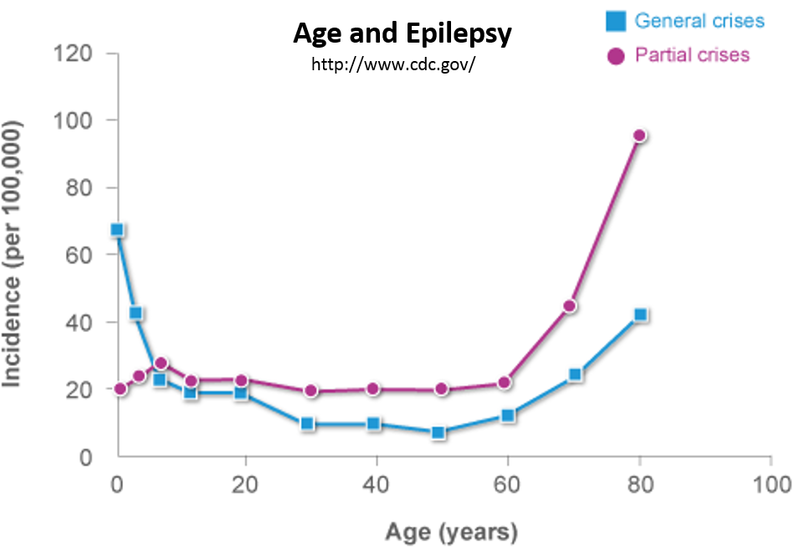 The frequency of epilepsy as a lifelong experience is different from a case where it comes on later in life. people who experience this form of life change just before retirement, by a decade or two, still cost the system in the long run. If we look at when the highest costs are generated, we find that every patient is of relatively equal financial risk, be he/she of low, moderate or high risk for the disease impacting the cost of care for their entire life. It is the events that take place once the “Great Event” occurs in someone’s life, that determines that individual’s long term outcomes and chances for reduced quality of life and income, or not. Both individuals and healthcare systems groups (corporate and/or npos) have the responsibility of better managing these people. The scenarios in this review do not include cases of comorbidities, such as older epileptics with a history of obesity, diabetes, or some mental health diagnosis. They also do not include the forgotten people with epilepsy who are institutionalized, and whom due to this produce the highest burden of all with epilepsy on the health care system as a group. The cases presented here are also very individualist in nature. The highly expensive long term care facility option present could in theory be reduced greatly by improving these programs. 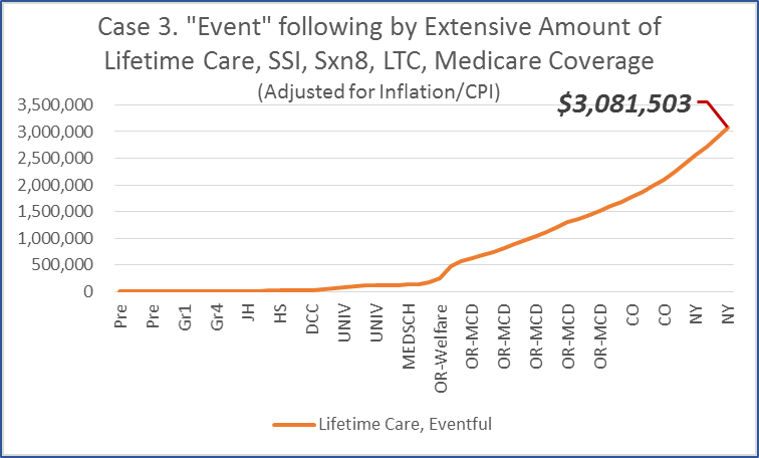 Even so, such savings will not effectively reduce to long term care costs in half, like the second version of this high risk model was used to display (the 50% reduction across all classes for cost). This also demonstrates just how much of an impact increased longevity of people can have on the value of health care overall. If I am still around and reach the age of 80 (2037/8), I expect there to be no healthcare system in place that is at all like the system we have in place today. Each and every health care system, health care facility, health insurance company, and non-profit group has to change its interpretation of its role in improving population health. The current system does indeed seem to be a failure waiting to happen, based on the predictive modeling and health economics analyses demonstrated on this page. Historical Medical Geographer and Disease Detective. Investigating and interpreting the past in population health, with applications for the future. This entry was posted in Managed Care. Bookmark the permalink.